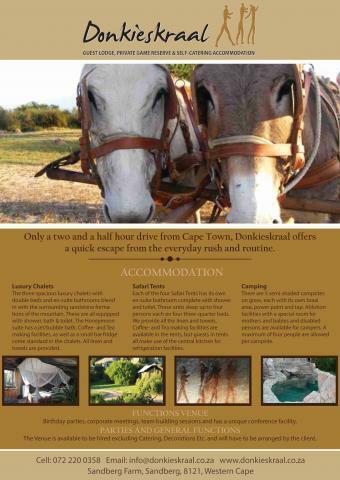 Only a two and a half hour drive from Cape Town, Donkieskraal offers a quick escape from the everyday rush and routine. The three spacious luxury chalets with double beds and en-suite bathrooms blend in with the surrounding sandstone formations of the mountain. These are all equipped with shower, bath & toilet. The Honeymoon suite has a jet/bubble bath. Coffee- and Tea making facilities, as well as a small bar fridge come standard in the chalets. All linen and towels are provided. Each of the four Safari Tents has its own en-suite bathroom complete with shower and toilet. These units sleep up to four persons each on four three-quarter beds. We provide all the linen and towels. Coffee- and Tea making facilities are available in the tents, but guests in tents all make use of the central kitchen for refrigeration facilities. 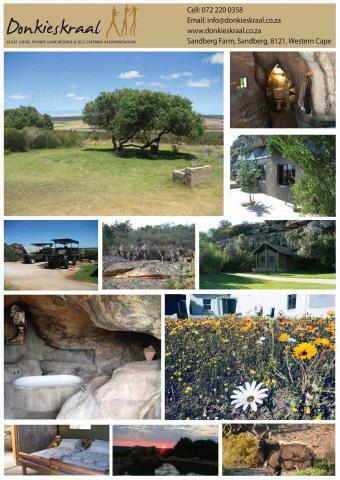 There are 5 semi-shaded campsites on grass, each with its own braai area, power point and tap. Ablution facilities with a special room for mothers and babies and disabled persons are available for campers. A maximum of four people are allowed per campsite. Birthday parties, corporate meetings, team building sessions and has a unique conference facility. The Venue is available to be hired excluding Catering, Decorations Etc. and will have to be arranged by the client.